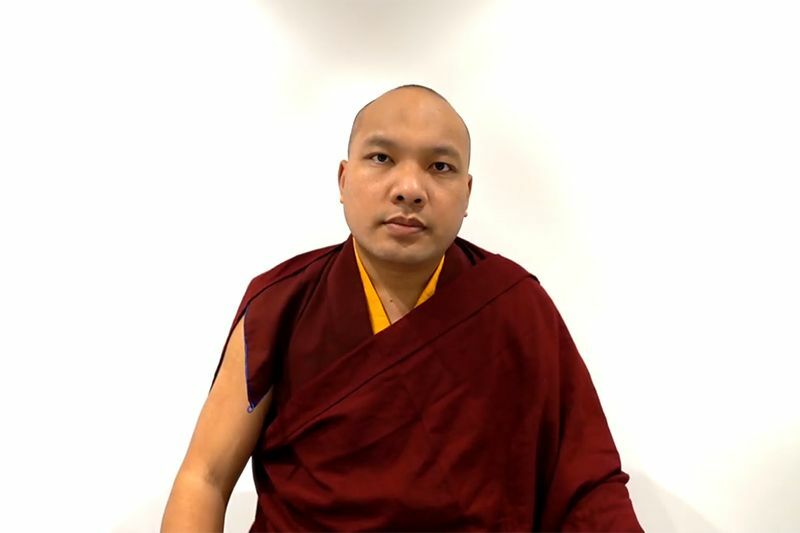 In this, the first of three sessions on the 3rd Karmapa’s Aspiration of the Mahāmudrā of Definitive Meaning, His Eminence Goshir Gyaltsap Rinpoche presented an overview of the precursors necessary for mahāmudrā practice. 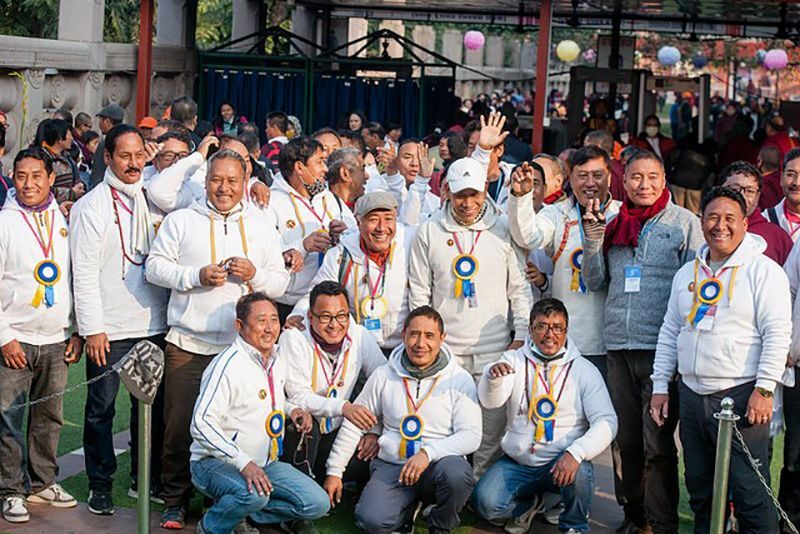 The crowd in the Monlam Pavilion, smaller this year but no less devoted, welcomed Gyaltsap Rinpoche with the usual solemn dignity. Rinpoche began by reminding the assembly to generate bodhicitta: “For the sake of all our mothers throughout space, please listen with the idea that you will benefit all sentient beings.” Rinpoche explained that His Holiness the Karmapa, unable to be present for the Monlam this year, requested that he teach this text, a distillation of all the practice lineages of the Dakpo Kagyu in the form of an aspiration. Rinpoche began by remarking on the vastness of the opening supplication to all gurus, yidams, Buddhas, and bodhisattvas: “We pray to them in infinite number.” He added, “We make the aspiration without any ego-clinging. If we cling to reality, it’s a delusion and the aspiration will not have much force.” We should make the aspiration realizing the empty nature of things, which nonetheless appear due to causes and conditions. This attitude will generate a powerful result. 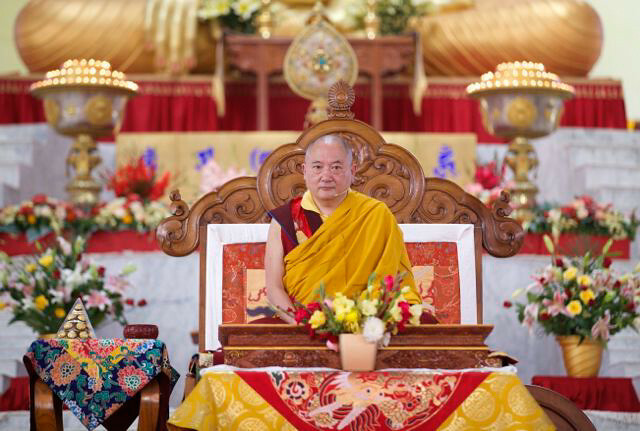 In addressing the importance of faith, diligence, and wisdom, Rinpoche focused particularly on wisdom or prajñā. He drew a distinction between intellectual intelligence and the wisdom that realizes the nature of mind, mahāmudrā. The latter is the profound prajñā we seek. There are many stories in the Kagyu lineage of uneducated people who nonetheless realized this profound wisdom, becoming siddhas. The next section concerns the three trainings: listening, contemplating, and meditating. 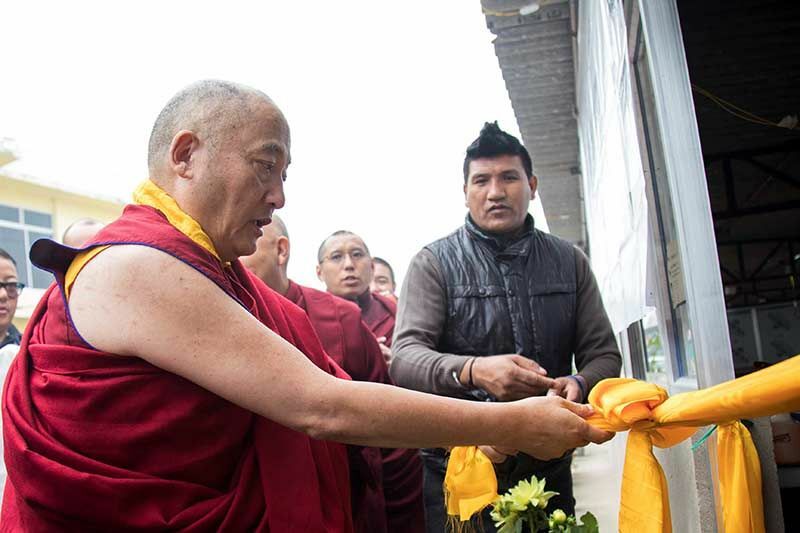 Rinpoche noted that the dharma removes our ignorance and delusion, starting with the coarsest obscurations which are eliminated simply by hearing the dharma, and moving through to the subtlest defilements. First we study, and then we apply logic to understand key points, such as the emptiness of phenomena, the fact that all sentient beings have Buddha nature, the workings of karma, and the reality of our past and future lives. Step by step, we remove doubt, especially by meditating once we have established correct view. Rinpoche added that although we need to develop our realization of mahāmudrā, we don’t need to create anything. The nature of our mind has been there all along. We only need to realize it. The next section concerns the danger of falling into the two extremes of eternalism and nihilism. Rinpoche gave an incredibly clear explanation of both the coarse and subtle levels of these pitfalls. Two coarse forms of eternalism include clinging to the idea of a permanent self, and the tendency to believe in an eternal God. Two coarse forms of nihilism are believing our current life is the only one, and the belief that beings we cannot see don’t exist. Subtler forms of delusion include the belief that emptiness is nothingness, or that one’s conduct doesn’t matter due to the empty nature of phenomena. The ultimate nature taught by the Buddha is not something and not nothing; it transcends the objects of mind. If we know all phenomena are neither existent nor non-existent, we will naturally develop realization of mahāmudrā, freeing ourselves from confusion. From this point on, the text focuses directly on mahāmudrā. It first emphasizes the ground, the mind’s nature. Rinpoche commented that there are many analogies for the Buddha nature inherent in each sentient being. Beneath our afflictive and cognitive obscurations, the mind is pure. When we eliminate our clinging and tendency to elaborate, great compassion is spontaneously present. The empty quality of mind is its freedom from elaboration, and the clarity aspect is the compassion. 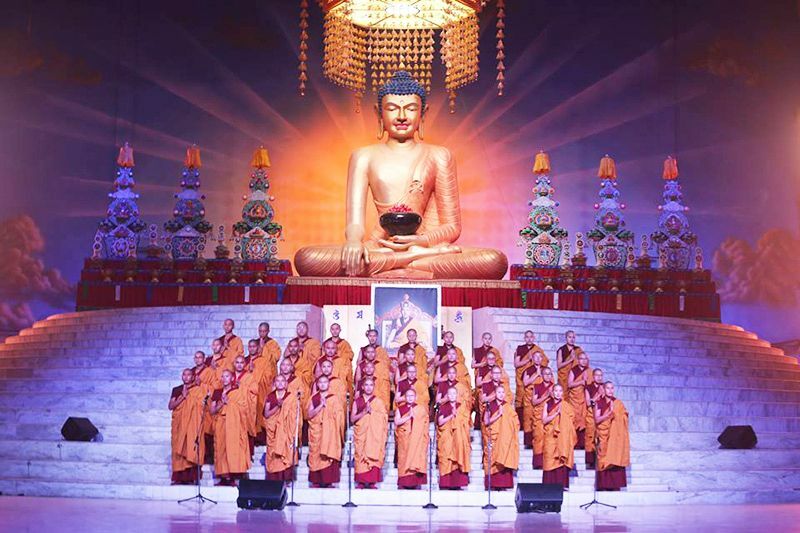 The Mahayana Supreme Continuum treatise (Uttaratantra Shastra) likens the empty quality of Buddha nature to water, and compassion to water’s inherent quality of moisture. The emptiness and compassion are not two separate things. We gradually approach realization of the nature of mind through the yoga of mahāmudrā. Rinpoche commented that although practicing mahāmudrā will remove our obscurations, in the beginning we have too many obscurations to practice it, so we must first remove some of them through the preliminary practices (ngondro). In more advanced practices, we visualize ourselves as the yidam deity to purify our obscurations, especially our fixation on the self. 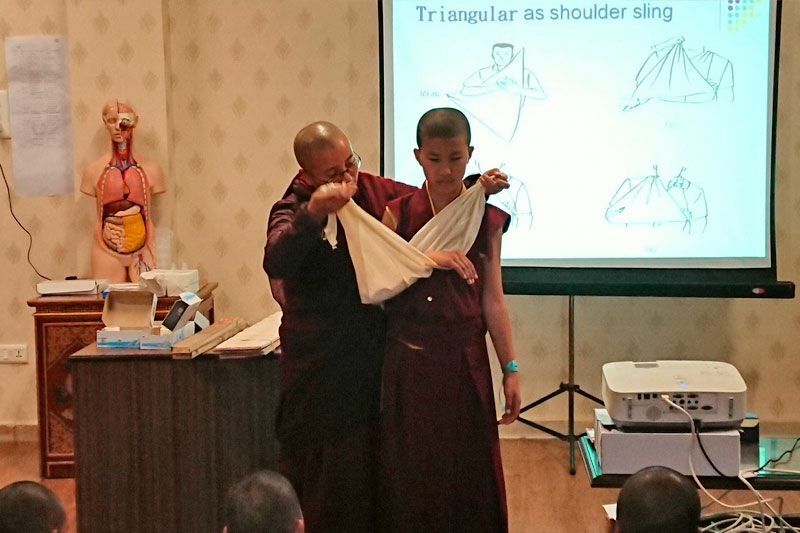 As our obscurations gradually disappear, we can display many different form kayas for the benefit of sentient beings. This is why mahāmudrā is so well-known and sought after; it is the distillation of all the tantras.